Kamen Rider Hibiki releases have been making their way out much more quickly this year. Just released in September was Kamen Rider Ibuki, we’ve got Todoroki coming up in January 2019, and now we can confirm the release of S.H. 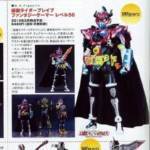 Figuarts Shinkocchou Seihou Kamen Rider Zanki in May 2019! Joining the other Oni of Hibiki, Zanki is another excellent recreation of a gorgeous suit from the series. Zanki includes alternate parts for his Henshin Kigen Onka, 3 disc animals, several sets of hands as well as his trademark Ongekigen Retsurai guitar weapon. S.H. Figuarts Shinkocchou Seihou Kamen Rider Zanki will be released in May 2019 for 7020 yen as a Tamashii Web Exclusive. Be sure to get in touch with your preferred middleman or service to secure an order. While orders may be closing this month for S.H. Figuarts Shinkocchou Seihou Kamen Rider Ibuki, Bandai has release a fresh set of official images of him on their blog. Although this figure won’t actually be released until August, it looks absolutely stunning in these shots. 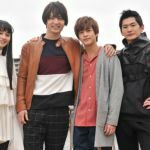 Perhaps more importantly though, these images give us our first official look at Seihou releases for Kamen Riders Todoroki & Zanki! Both of these figures have made appearances at previous Tamashii events with Ibuki, though so far he’s the only one of the trio due for release. Could this mean another pair of Oni will be joining our collections soon? We can only hope. We’ll keep you up to date on all of these gorgeous figures when and as more information becomes available.